Being able to have one’s cake and eat it too is often times a goal for many, even if they’re not willing to admit said ambition. In regards to those that partake in a Heart Healthy diet, I’m here today to tell you can have your sauce and eat it too. A few tips when choosing jarred pasta sauce: 1) the smaller the ingredient list, the more fresh, less preservatives are in the sauce 2) if you can’t pronounce the ingredients or don’t recognize the name of an ingredient, the sauce is probably not something I want keep in my cupboard 3) Opt for organic. What brand of sauce fits that criteria? 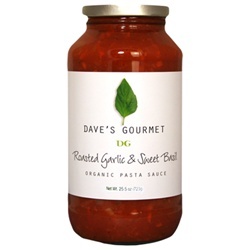 Dave’s Gourmet Pasta Sauces, of course! With Dave’s Gourmet’s Pasta Sauces, which are low in sodium, you can enjoy a pasta filled meal without the guilt that you’re going overboard on the recommended amount of sodium for the day! 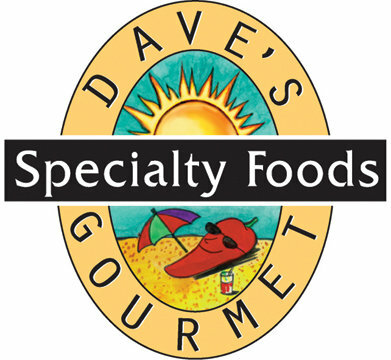 Dave’s Gourmet started with the selling of hot products in a small restaurant, Burrito Madness, but now produces a variety of products, from hot sauces to drink mixes. Again, today I’ll be focusing on Dave’s Gourmet Pasta Sauces. While Dave’s Gourmet’s Butternut Squash is the best selling sauce, as it’s the WINNER BEST PASTA SAUCE- NEW YORK FANCY FOOD SHOW 2009, I wish there was more of a selection of sauces to choose from. How am I supposed to know how to use the additional sauces if there are a limited amount of recipes provided? I don’t mind experimenting in the kitchen, yet some direction and/or insight on Dave’s Gourmet’s preference of how to use the Red Heirloom or Roasted Garlic & Sweet Basil sauce would be appreciated. Organic tomatoes (heirloom and other varieties), water, organic carrots, organic onions, organic tomato paste, organic extra virgin olive oil, organic evaporated cane juice, organic garlic, organic spices (including organic basil and organic oregano), and sea salt. Gluten free. Dave’s Gourmet has knocked it out of the park with their sauces, perfecting the necessary consistency, not too thin, chunky or thick. With just the right amount of acid, these jars priced at $8.99 for 25.5 ounces, it worth the purchase! Who needs more than that? Next, I’ll be getting my hands on Dave’s Gourmet Organic Spicy Heirloom Marinara Sauce, which is the Winner of the 2009 Scovie Award for Prepared/Pasta Sauce! Who wants to join me in eating this scrumptious sauce and having it too? !